SAN FRANCISCO -- A standoff between a car theft suspect and San Francisco police ended peacefully in the South of Market area. A man who ran away during a California Highway Patrol traffic stop dangled from a two-story building for almost two hours threatening to jump. Police are crediting the suspect's cat with coming to the rescue and helping to end the standoff peacefully. A family member brought the suspect's cat to the scene to help coax the man down. The standoff began on 10th Street near Harrison Street shortly before 4:30 p.m. and ended shortly after 6 p.m. The suspect was driving a white Toyota Highlander when a CHP officer pulled him over around the corner on Dore Street, but while the officer was taking down information, the man ran from the stop, according to CHP Officer Vu Williams. Officers later learned that the Highlander had been reported stolen. The driver jumped a fence and ran up the fire escape of a two-story building on 10th Street near Harrison. He climbed over to another window where he stayed perched and barefoot, refusing to come down. 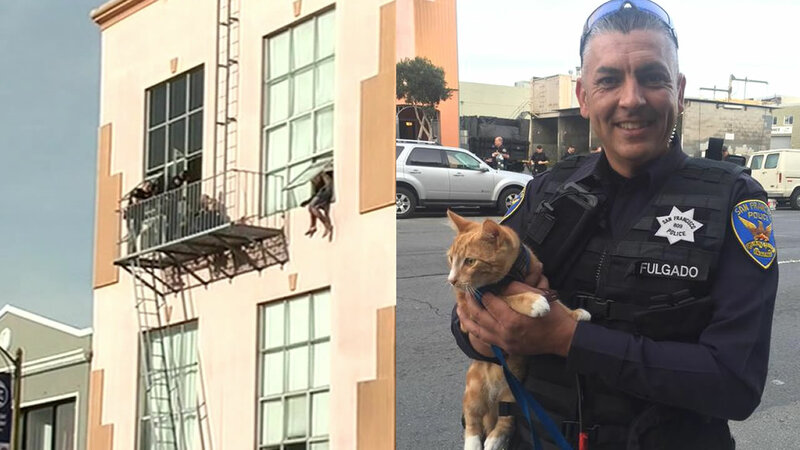 Police shut down 10th Street and climbed the fire escape, trying to talk the man down, according to San Francisco police. A large crowd gathered in the area as the standoff continued.